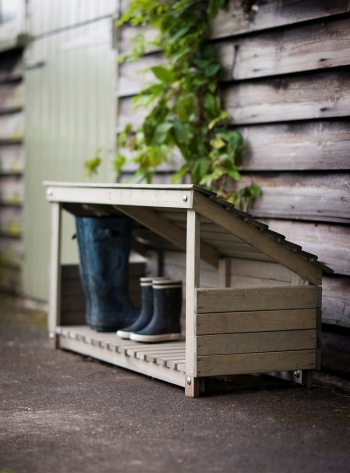 Make a splash in the garden with our perfectly designed Wellie Store, ideal for keeping all those muddy boots and shoes neat and tidy. So whether its farmlands or festivals, your wellies will perfectly primed for some serious puddle stomping. Our wellie boot store combines classical shaping with practical design, precisely made for your garden, and your wellies. You’ll find it’s the perfect fit for all your outdoor footwear, with ample of space to store up to 5 pairs of your favourite boots, from wellington boots to riding boots, hiking boots and even the occasional pair of snow boots. 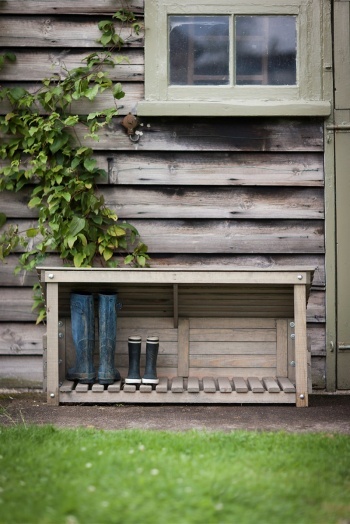 This wellie rack presents a contemporary and natural solution to any boot room, hallway or porch, suitably hiding all your muddy boots, keeping them safe and dry all year round. Constructed from stained Spruce, with a slanted roof and 3 sides, it is hardwearing and robust, ensuring the product will be long lasting and durable, keeping your wellies looking stylish and fully protected.